What a DVD this is. As a long time Judas Priest fan, this is a great thing. Mind you, it’s not without its issues, but overall, what a killer set. Let’s address the main (pretty much the only issue) right at the start here. There’s no KK Downing. I’ve for the most part avoided getting caught up in any kind of “he said, they said” about the exit of Downing. Suffice it to say there are generally three sides to any story – in this case his side, their side and the truth which is somewhere in the middle. The fact is, KK Downing is out of Judas Priest. His replacement Richie Faulkner does a great job. In some cases he reproduces Downing’s parts nearly perfectly. At other times he works to make them his own a bit. In all cases, it works. I suppose the other complaint here addresses some of the promo materials for this set. The official PR for the DVD says that the tour included at least one song in the set list from every Judas Priest album. Well, that’s not really accurate because they never played anything from the two Tim “Ripper” Owens fronted albums. That complaint, though is more about the PR campaign put forward by the label than it is about this set. I mean, the performance is awesome. It’s great to hear songs performed live that have seldom been played in the live venue before. The sound and video are both great. 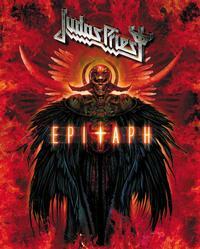 This is an incredible DVD recommended to all fans of Judas Priest, as long as they can get past the KK Downing thing. If you give Faulkner a real chance, he’ll impress and so will this DVD.